A Calgary woman's ad promises to bring women to where "no man has gone before." A Calgary woman's ad isn't promising much pay for a dangerous expedition to the Arctic. And she's not exactly guaranteeing a safe return, either. "Women wanted for hazardous journey, small wages, bitter cold, long months of complete sunlight, constant danger, safe return hopeful, honor and recognition in case of success," it read. It's signed by Susan R. Eaton. Eaton is looking for female explorers bold enough to answer her call, its wording inspired by an advert Antarctic-explorer Sir Ernest Shackleton supposedly printed in The Times a century ago. Those who respond to Eaton's posting will be going to where "no man has gone before" — her all-female team plans to snorkel the entirety of the Arctic Northwest Passage. The Sedna Epic Expedition — named after the Inuit goddess of the sea — will draw attention to the effects of global warming in the Arctic. Scientists will document the disappearing sea ice that makes their snorkeling trip possible, all while tagging Greenland sharks. There are also plans to bring ocean education programs to local Inuit communities. In 2014, the team undertook a a test-run from Labrador to Greenland. Next up is a warm-up mission to Baffin Island in July before attempting a 100-day snorkel relay over the summers of 2017 and 2018. Unpredictable sea conditions, gale-force winds, sharks, walruses, and drifting pack ice will make the expedition a dangerous one, Eaton told CBC News. Eaton is a conservationist, geologist, geophysicist, explorer and journalist. Her talented team is also chock full of renaissance women with 10 divers who hail from five different countries. Among them include ocean scientists, explorers, movie-makers, photographers, artists, educators and polar divers. Last year, she was named as one of Canada's top explorers by Canadian Geographic. She was one of 18 women to make the list. "We're not simply interested in a world's first — which would be a snorkel relay of the Northwest Passage — we want to work with the Inuit communities along the way, we want to leave a legacy of ocean education outreach," Eaton told Global News. 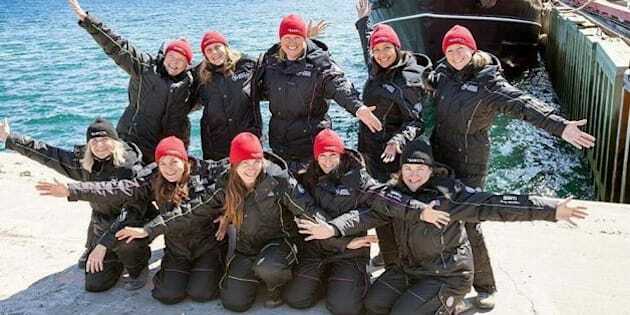 The women on the expedition hope to translate their findings into educational programs that will inspire women, youth and the aboriginal community to "think big" when it comes to tackling climate change, according to the expedition's website. Eaton is currently fundraising to cover her costs for this summer's expedition. "Just as in Sir Ernest Shackleton's day, polar exploration is not for the faint of heart," reads the explorer's GoFundMe page. It may not be for the faint of heart, but the Calgarian is certainly up for the challenge.